After moving to China, the best way to adapt to China life is by using the same apps that locals use. Of course, we all need to eat so the most important apps to first download in China (besides learning Chinese and map apps) should be related to food. Nothing is better than authentic and extremely diverse Chinese food, but sometimes you really crave food from home or some other type of Western food. Luckily, food delivery apps have a wide variety of whatever you might be craving. And there’s nothing better than ordering your dinner while still at the office and having it arrive at your home the same time you do. China currently has three major food delivery apps that are completely in Chinese and two additional English apps that are primarily for non-Chinese speakers. Although they all function about the same and accept the same forms of payment (Alipay, Wechat, or COD), some apps charge higher delivery fees than others. If you can’t read Chinese, don’t be afraid of the Chinese apps. After using one a few times and having a Chinese friend translate some of the options, you’ll soon get a hang of how to order even though it’s completely in Chinese. This app is currently dominating the food delivery market in China and the name translates to “Are you hungry?” in English. Delivery fees for all three Chinese apps are usually less than 10 RMB or sometimes free. Closely following behind E Le Ma, Mei Tuan is also extremely popular. Most Chinese restaurants have a minimum food order amount of at least 20RMB, although this varies from restaurant to restaurant. Mei Tuan offers coupons that can be used the next day if you share a link with a friend on Wechat. 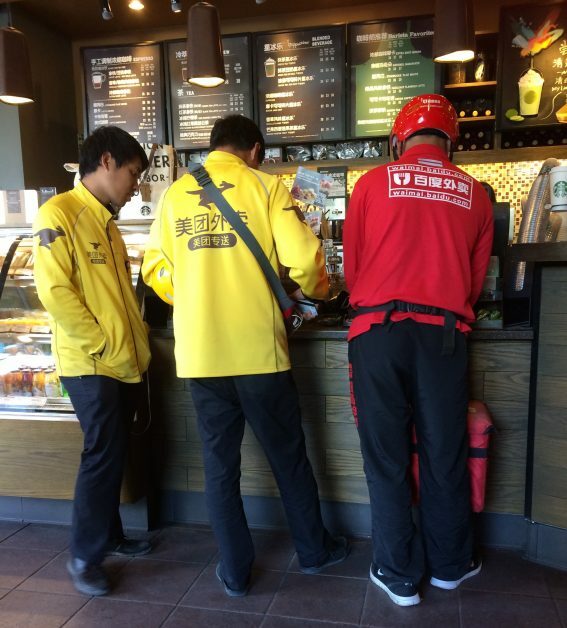 The search engine Baidu also has a food delivery app and you will often see both Baidu and Meituan delivery guys standing in line in front of you at Starbucks nowadays. Can you believe society now feels going out for a leisurely cup of coffee is too much to work? Ridiculous, but as they say, “judge not, lest you be judged”. As an expat in China who can’t read Chinese, Sherpa’s is a godsend. Their app is all in English, which makes it worth the higher delivery fees that they charge. Delivery fees start at 10 RMB and quickly go up from there if you’re ordering from a restaurant that is far from where you live. Although for Sherpa’s, if you order between 1-6pm Monday through Friday, the delivery fee is waived. You also must order at least 100 RMB worth of food after 6pm for them to deliver to you and live in either Beijing, Shanghai, or Suzhou. Although they have a Chinese version, this app targets foreigners in Shanghai and Beijing. If you can’t speak Chinese, it’s a good idea to download this app as well as Sherpa’s to compare the two. Delivery fees start at 15 RMB and also quickly go up from there if you live far away from the food you want.They have a minimum order of 68 RMB for most restaurants although it varies by restuarant.